Maid-chan has a scheduler worker for handling various daily tasks. For example, Maid-chan will send out daily good morning and good night greetings upon subscription. This feature is known as “Daily Offerings”. Daily offerings contain of two parts: greeting and image. Greetings are taken from maidchan/constant.py while offerings are taken from offerings/stock/ directory. Maid-chan supports event type morning messages, e.g. : Halloween, Christmas, etc. If “force” flag is turned on, Maid-chan will use a specific message for the morning greeting. Otherwise, there’s a probability that Maid-chan will use seasonal type of messages. In general, offerings text functionality has two types: normal and special with 2% of probability. 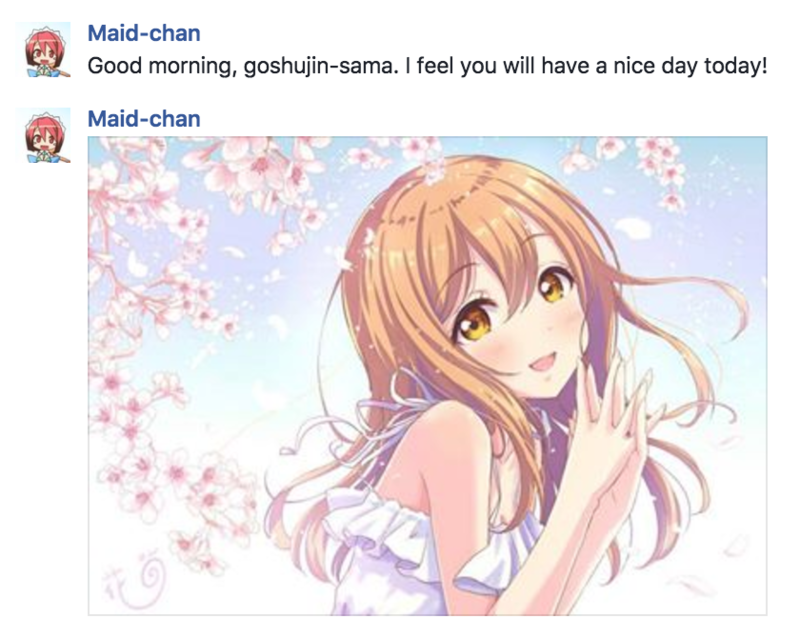 For example, Maid-chan sends morning greeting more than half an hour later than usual because of overslept (2% chance). Greeting text on any specific day is the same for everyone, as it is stored in scheduler’s metadata. In addition to text-based greetings, Maid-chan offers image as an addition. For all images which are stored under offerings/stock/ , Maid-chan will pick 2 random images on daily basis for morning and night offerings. Each day, used offerings are moved to offerings/used/ directory. If there is no image under offerings/stock/ directory, Maid-chan will simply skip sending out images as a part of daily offerings. You can subscribe & unsubscribe to Maid-chan’s daily offerings via subscribe offerings and unsubscribe offerings command in the Messenger. Upon subscription, you will be asked 2 questions: your usual waking up time and your usual sleeping time.